This specially designed #2 or #3 point will quickly and consistently drill into .036″ to .210″ steel without slipping or damaging the panel. 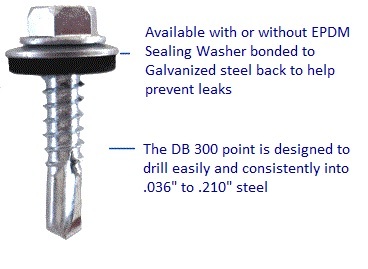 The DB 300 is available in lengths from 3/4″ to 8″ and is available with DB’s extra thick 5 micron electro zinc plating or in DB’s Mag Life Coating. Click here for technical information on #10 diameter fasteners. Click here for technical information on #12 diameter fasteners. Click here for technical information on #14 diameter fasteners.